Glen Davis is about 3 and a bit hours from Sydney and is located in the second largest canyon in the world after the Grand Canyon – the Capertee Valley. From Sydney take either the Bells Line of Road or the Great Western Highway through the Blue Mountains to Lithgow. 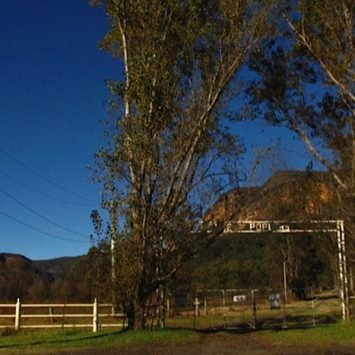 Follow the highway out of Lithgow for about 6 Kms and turn onto the Castlereagh Highway leading towards Mudgee. You will drive through Cullen Bullen, Ben Bullen and when you arrive at Capertee look for the sign to Glen Davis just after the Road House Cafe. 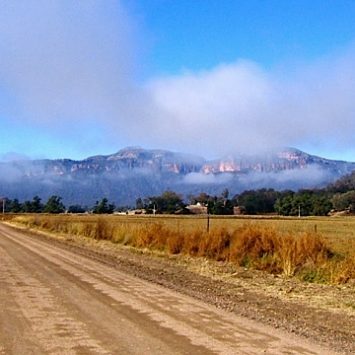 The winding road through the Gardens of Stone is part of the reward as this road wanders through the sandstone turrets of Mt Airly, after about 22 kms you are into the valley floor and finally you arrive at the Capertee River where you will turn right to Glen Davis, approx. 35 kms from the Capertee turnoff. Once over the low river crossing you pass the Hotel on your left and the Poplars Gate is just another 100 meters ahead…literally the end of the road ! The double metal gates are the entrance which will be closed so can you please make sure this gate is shut and chained at all times as there are cattle on the property.